Connect with the full light of your soul and Higher Self in this new guided meditation with Archangel Metatron channeled by Melanie. 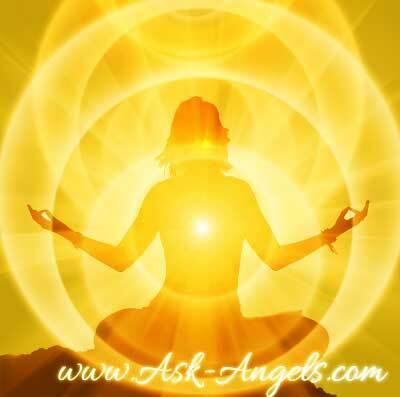 Breathe, relax, and listen to tune into the guidance, love and frequency channeled from the Angelic Realm. Simply click the play button below to listen, or right click (ctrl click mac) to save to your computer. Or scroll down to read this channeled angel message with Archangel Metatron transcribed below. Greetings dear one. Indeed, I am Archangel Metatron and I greet you in this moment outside of time and space, to speak with you about the part of you outside of time and space. The spiritual, powerful, blissful, serene part of you directly connected to Divine Source and to all, at every moment and in every time. The spiritual being that you are, your higher self connected to higher consciousness is connected to all that is and guides you, assists you, watches over you, looks out for you, and acts as a guide for you in this life. Nudging you away from distractions and roadblocks and false truths, and helping you to keep on track in this game of life you are playing. The game of life which is ever unfolding around you and which you are able to take more and more conscious control over, stepping into your power as a player in the game of life with objectives and strategies so complex, with players so advanced that there is no real comparison in your realm among games or sports or activities other than the word and the concept. And in this awareness, there is great learning and the opportunity for you as a physical being in the game of life, guided by the spiritual essence, the soul that you really are in truth, to make a choice, to play well, to win, to advance, to graduate from life advancing forward on your soul journey in the higher dimensions and realms of existence. The game you are playing now in this time and space that is the present, is already an advanced level, for the third dimensional plane of existence, which you are experiencing, is not all you are experiencing now as it has been in lifetimes past. The third dimension is merely the base, and the magic found within the physical forms of earth, air, fire, and water, have opened you up as a soul and spiritual being in physical form to experience the ether, the magic, the astral, the fourth and fifth dimensional planes of existence and beyond while you are still living, while you are still a physical being, a player in the game of life. Your winning ticket, your secret strategy, that which will serve you most, is recognizing that the energy and strength and skill you need to progress lies not outside of you, but is accessed from within. You are guided well. You are loved and supported. You are assisted, you are encouraged, and you are helped by a team of guides and angels who you have begun making contact with, who help you and love you. And as important as tuning into the guidance from these beings, is tuning into the frequency and light and wisdom and truth that is yours. Yes, you are connected to all that is, you are one with everything and this perspective serves you. But even within the veil of illusion, layers of illusion and separation, you have a higher self. The Divine blueprint of your perfection, wisdom, knowledge, and understanding, the you completely immersed in higher consciousness who you are able to connect with now and at any time to serve your own life. Through this, awareness and knowing of who you really are, of what is really real you are able to make the choices, to progress further in your game, to serve and love others, all of life, and to make a difference, to channel your light, your frequency, your power, your understanding and awareness into this realm, to serve life, earth, and all beings for the highest and greatest good. As a physical being you come from the earth, you are one with earth, and energetically this connection with earth is essential for making the link with the divine realms and with your higher self. The energy flows up from the core of the earth. Imagine this flow, this light at the core of the earth which you are one with, which you are a part of, flowing up and opening and purifying, flowing through your root chakra, your sacral chakra, and your solar plexus chakra. These lower three chakras need to be purified and opened in order for the energy of earth to make its way up to your heart, which is the doorway to the higher realms. Root, sacral, and solar plexus are cleansed now as the light of earth flows up, the divine light of earth, releasing blockages, fears, and attachments. We draw your awareness now to your choices in every moment. When you remain in love, blockages cannot take hold. When you are in service to others in the name of love, blockages cannot take hold. It is when you get wrapped up in fear and insecurity that your energetic body responds, creating a blockage of the flow of light in these energetic centers. Calm, relaxed, present, and aware, this is the state of being which serves your energy body, your chakra energy system, and which allows the light at the core of the earth to flow up. When this light is able to flow, reaching your heart, and fueling the flame of your open heart, it enables you to love, not in a conditional sense or even a romantic sense, thought this may be experienced in your game of life, but love in an unconditional sense. You are able to feel and experience the unconditional love that all of life has for you, and then overflowing unconditional love as a soul and spirit in service of all life, in service of others. Loving, sharing, giving, and making a difference. When your heart is open, you are able to access the higher realms. When your heart is open, the energy of the earth, of light, is able to continue to flow up, opening your throat, third eye, and crown and continuing up, flowing up into the light of the Divine, lifting up into the realms of spirit. Lifting up, going up, way up into direct presence with Source, with God, with All That Is, into direct presence with your higher self who steps forward now to merge with your energetic being now. Experience merging now with your higher self. Feel your power increase like an electric charge or volt. Feel your frequency begin to vibrate at an increased rate as you merge with your higher self, with higher consciousness also known as Christ consciousness, cosmic consciousness, soul consciousness, God consciousness, awareness, enlightenment, nirvana. Experience this now for this is the natural state of being of your higher self, who you merge and link with in this moment, bringing the enlightened perspective of the Divine into your experience now. Whether you are tired of life and fatigued, or if you are in love with life and energized, your higher self has blessings for you, has tips and tricks and guidance and rejuvenation. For like an angel or spirit guide, your higher self is directly linked to the Divine. Your higher self is your most personal messenger of pure, divine bliss, serving to keep you aligned with that which is most important for you now in your game, in your advancement towards graduation, towards progressing forward and further in soul awakening, which has no end. Even your guides and ascended masters and teachers are journeying, are advancing, and growing. And so embrace your growth, embrace your game, embrace your choice that you are offered with. The choice to serve self, to stay in neutrality, to float and exist, and to repeat the karmic cycle of lifetimes waiting until some point in the future to make the choice, which you are ready for now. Commit to mastery, to love in every moment, to serving and loving others as yourself. Recognizing your oneness with all makes this easy, gives you the willingness to love unconditionally, to serve unconditionally, to assist others unconditionally. For when you do, you are serving and loving and assisting the Divine. YourSelf. Your higher self, your greater self, that is all. And when you need a boost… Ground and lift, open your chakra energy centers, connect with the light of the Divine, and merge with your higher self. In mind, body, and spirit, receive the download of your higher self to rejuvenate and replenish, to heal, and to inspire, to serve you in your game of life, in your mission of service and love to others. Your time is now to master this physical plane, in this life, and within this life accessing the higher realms and dimensions of experience and of love. You are assisted, supported, and lifted. Now, feel all this light of the Divine and of your higher self, pouring down now in through your crown, your third eye, your throat, your open heart, your solar plexus, sacral, and root, this light of the Divine and of your higher self anchoring into your physical body, clicking into place. And now grounding, roots extending down, anchoring all this bliss and benefit and love into the present moment, into the light at the core of the earth, into your experience for you to access at any time through awareness. Keep your energetic connection to your higher self open by remaining centered, present, and in love. Keep your energetic centers awake and flowing light through them in a relaxed, present, and natural state of being. Release tension and struggle. Release the compulsion to only serve yourself, for your soul desire is to walk the path of love, the path of positive, the path of joy. This is why you are listening to these words, this is why you are connecting with your higher self of light, this is why you are here to serve and love and make a difference and through this growth and learning and mastery of the game board of life, graduating, ascending, progressing forward, moving forward, onward on your path as a soul and as a divine spiritual being. Know that you are loved, assisted, blessed, and lifted. I am Archangel Metatron and I leave you for now with my blessing and with the blessing of the Divine, of love, of frequency, of calm serenity and rejuvenation. You are so loved. Goodbye for now. If you would like more messages from Archangel Metatron like this one, Click Here Now. Words are not enough to say thank you. Thanks so much for this meditation!! I love Ask-Angels. Messages and channels with the Angels and Melanie. Dear Melanie, thank you so much for this higher self meditation with Archangel Metatron. It was amazing as I felt tingling on top of my head when I did this meditation. I am in touch with angels. I recently discovered their in my life and are always here for me and my loved ones. We’ve been helped in a lot of ways. Help always comes even when no one is around at first. It amazes me how they know when they’re needed and always come. I feel their power and know their with me even in a crowd of non believers. They are truly from the Divine Kingdom many call Heaven. Melanie Thank You for sharing these incredible meditations. I am drawn to your voice and find these meditations quite soothing. I am incredibly grateful to have found your wonderful site! Melanie, thank you so much for these magnificent messages from the realms of Love and Lught. They are powerful forces for good! My love and blessings and deepest gratitude for sharing your gift and for recreating this beautiful website. It´s so important to me hear this chaneling, that I just can pray and send Bless for You as a Thank You! God Bless You!